Posted 8:03 pm by Administrator & filed under News. The Chicago Plan Commission approved One Chicago Square, a mixed-use development in River North designed by Hartshorne Plunkard Architecture and Goettsch Partners for JDL Development. 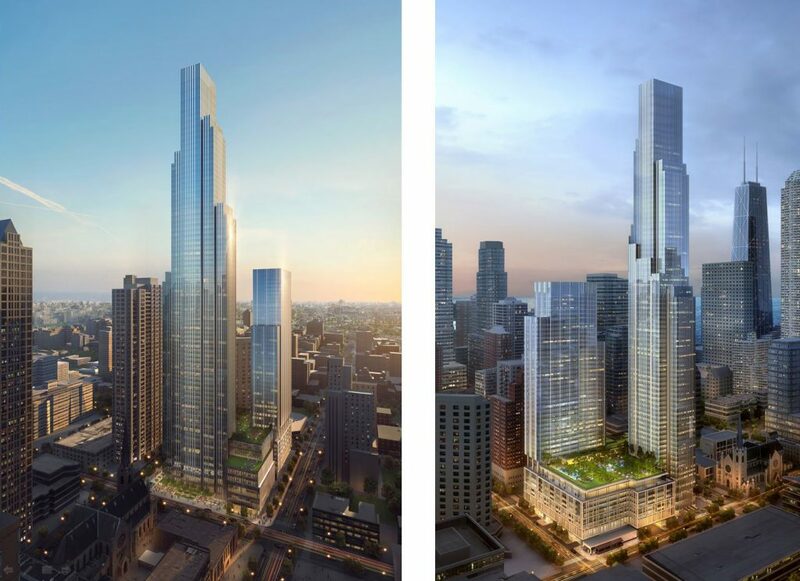 Comprised of two towers reaching 49 and 76 stories high positioned atop a shared podium, the planned project will reach 1,011 feet, making it the sixth tallest building in Chicago. The nine-story base will house a multitude of uses, including retail and restaurant space, an organic grocer, special-event space, commercial offices, a two-story fitness center and wellness center, and parking concealed by residential units. The podium roof features a swimming pool and amenity deck adorned with recreational and lounge spaces. The high-rises will contain almost 900 apartments and condominium with luxury finishes. Opposite from Holy Name Cathedral, an urban park with extensive landscaping will serve as a public amenity for the community as well as residents. Pending final approval by City Council, the project is anticipating breaking ground in late fall 2018.